I really feel that this acheivement deserves its own post rather than thrown in at the bottom of another. The reason it was done that way was because that post was originally posted on a community site and I didn't want to make 2 posts at the same time. But here I can do what ever I want so here goes! It took me ages to finally get this mount! I love it to bits and I've been wanting it for AGES! Why did it take me so long you might ask? Well my beloved shaman, my main, is cursed it seems. The RNG Gods hate her with a passion when it comes to mount drops. 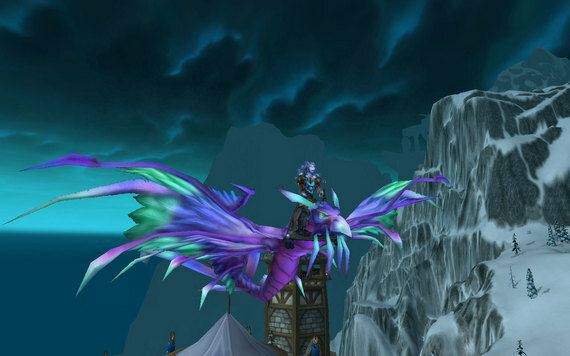 She only has 2 mounts that come from drops, the Bronze Drake and the Black Twilight Drake from OS10 3D. Not another single dropped mount does she have. I've bought the Chopper, the Travelers Tundra Mammoth, the Hodir Exalted White Mammoth. I have all the Argen Tournament mounts save the Argent Hippogryph though I intend to get it at some point. I've done the daily for the White Polar Bear since the first week of Wrath and nada. I've cracked open so many Oracle Mysterious Eggs that I could feed all of Azeroth for year. She's gone through all of her beer supply fishing and still doesn't have a Turtle. I've not seen the Zulian Tiger since vanilla and I've never seen the Raptor from there and they will be gone after today. I've killed Kael in Magister's Terrace nearly 90 times and I've only seen the White Hawkstrider 2 times and friends won those. I've never seen the Anzu mount drop. Baron hates me too. I'm completely dumbfounded at how seriously bad her luck is when it comes to mounts. But at least the grind is over and she'll have a brand new set of mounts to pick up when Cata drops in a few weeks. I'm just hoping they don't add another level to the acheivement or I'll probably scream!